As the medical device industry changes, companies are looking to achieve sustainable growth and business development. Corporate strategy executives are deemed the task of finding the next new project that will help propel their organization forward. Whether an organization’s next focused endeavor is organic or inorganic, it is the role of the Business Development executive to determine which decision will bring optimal return on investment for their organization. 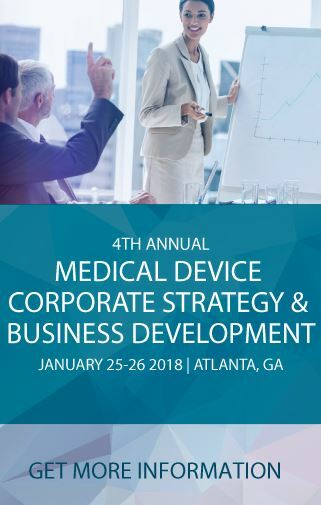 Q1Productions is holding their 4th Annual Medical Device Corporate Strategy and Business Development Conference on January 25-26, 2018 in Atlanta Georgia. At this one of a kind conference there will be more than 20 presenters to meld perspectives of industry veterans; including presenters from Olympus, Medtronic, and Alcon. In preparation for this conference, let’s review what some of last year’s presenters highlighted as the three main things to keep in mind when negotiating creative deal structures. Partnerships and M&A opportunities are very relational in nature. There are very few deals that involve a one-time payout, so it’s important to keep in mind there is skin in the game for both organizations. In order to succeed, both companies must understand the other’s vision, and keep in mind that the end result has to be a growth experience for BOTH organizations. This helps businesses negotiate fairly which, in turn, makes both organizations credible partners and mitigates risk. In order to build effective relationships with potential partners, it is important to understand what drives people, not just as business people but as human beings. No two people are going to approach the situation in the same way, especially when different corporate cultures are involved. “There are ways and methods to overcome the dysfunction of deal making by focusing attention on the human side of interacting with each other,” said Steve Plymale, President & COO of Profound Medical. He went on to compare a deal-making mindset to the one you would use when negotiating where to take a family vacation. People may come at it with different perspectives, because some of them are athletic and some just want to lay on a beach. However, if you understand the predispositions and idiosyncrasies that people bring to the table in making a deal, it can make the experience much more productive. A good rule of thumb to remember: how you get there matters just as much as the end result you are trying to achieve. Negotiation requires more strategic thinking than it did even 10 or 15 years ago. Two companies that would have never partnered before, now have common ground through technology. Technology providers that are doing applications like imaging or robotics can help facilitate a number of acquisitions down an organization’s pathway in the future. Deal making may be harder with outside the box thinking, but it also provides more opportunities for creative value building. Companies can now branch out into areas they couldn’t have before. It is important to keep these new opportunities in mind when negotiating and searching for value. The due-diligence team has an extremely important role in negotiation. There is always going to be the elements of the deal that are about value, valuation, reimburse-ability, and terms and conditions, but there are other things to consider before making a deal. Best deal makers consider if the acquisition, partnership, or product is the strategic fit for the whole life cycle. This means incorporating a successful integration approach at the beginning of negotiations. Any changes made to an organization in the process of merging can have a ripple effect. For example, when ending a relationship with a supplier, the due-diligence team must secure reliable second sourcing. There are many things that can go wrong, and planning for variables can make the difference between a successful deal and a failure. When I asked Nicholas Pachuda, Global Vice President of Orthopedic Innovation for Johnson & Johnson Medical Devices, what factor most determines if a new target will succeed, he replied: “[the] quality of the target’s Management Team.” He went on to emphasize that it is also important not to underestimate the importance of a well-orchestrated transition process. Negotiating value creation is a key component to business development. Establishing the right strategy and corporate development support, along with a focused M&A strategy, will be the best way to tackle current market challenges facing the industry. Other industry challenges that will be addressed at the 4th Annual Medical Device Corporate Strategy & Business Development Conference include Partnerships, digitization of healthcare, and organic vs inorganic growth.